Interest rate increases would have a major impact on the Swiss real estate market. Buyers would have to shell out more money to afford their own home. Current owners would also feel the financial pain of higher interest rates – albeit with a delay. In recent years, low mortgage interest has been the main force driving high demand for residential properties. 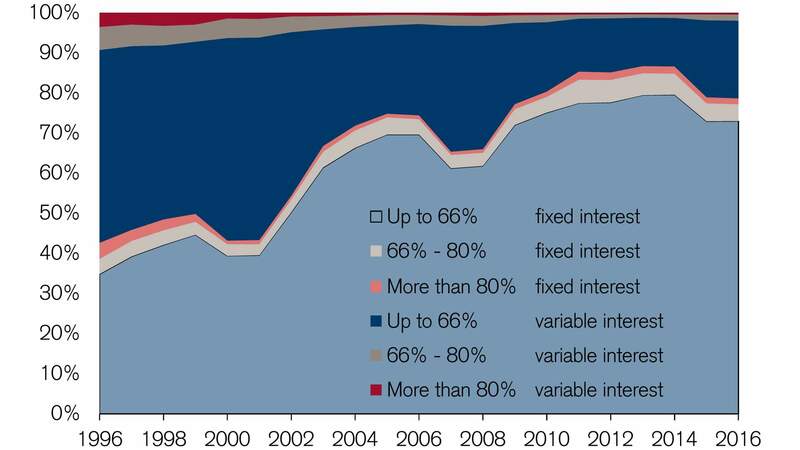 As mortgage interest rates were falling, the amount of mortgage interest charged to owners fell to 39 percent of the level seen in the year 2000. This situation tempted many households into fulfilling their dream of owning their own home. The resulting demand has caused property prices to skyrocket by a total of 76 percent since 2000. Focus on interest rates: How would a reverse in interest rates affect the Swiss economy? A continued rise in long-term interest rates in the near future would have various repercussions for homeowners, investors, and companies. Read more in Credit Suisse Monitor Switzerland. With every future increase in mortgage interest, the financing costs of a residential property also go up. The chart below illustrates the effect on a property worth 700,000 Swiss francs with 80 percent of its value covered by a mortgage. With current mortgage interest rates of 1.5 percent, the annual mortgage interest costs are 8,400 Swiss francs. If the mortgage interest rate were to climb to 2.5 percent, the annual expenses for a mortgage would shoot up to 14,000 Swiss francs. Thus, the financing costs of ownership rise quickly as interest rates increase. From a financial standpoint, this would make buying a new home less and less attractive. The result would be falling demand. After a very long period of extreme price fluctuations, that could trigger a decline in purchase prices. The extent and pace of the interest rate increases will determine the severity of the price correction. Because the percentage of speculative purchases is reasonably low and there is generally no excess supply of residential properties on the market, prices are not expected to collapse the way they did several years ago in the US, Spain, and Ireland. That is the imputed interest rate. At that level, owner-occupied homes ought to remain affordable despite rising interest rates. From a risk perspective, interest rate increases should not pose a threat to owners at first. Today's lending requirements imposed by banks demand that residential properties be affordable, even if with a long-term imputed interest rate above a certain level – usually calculated at 5 percent. Add to that the requirement that owners have to pay down their mortgage to 66% within 15 years, gradually increasing their financial flexibility. In contrast to the past, the majority of private households today take out fixed-rate mortgages. That means it is also less likely that many owners will experience higher financing costs over the medium term. Economically, the effect of higher mortgage interest on owners should not be underestimated. 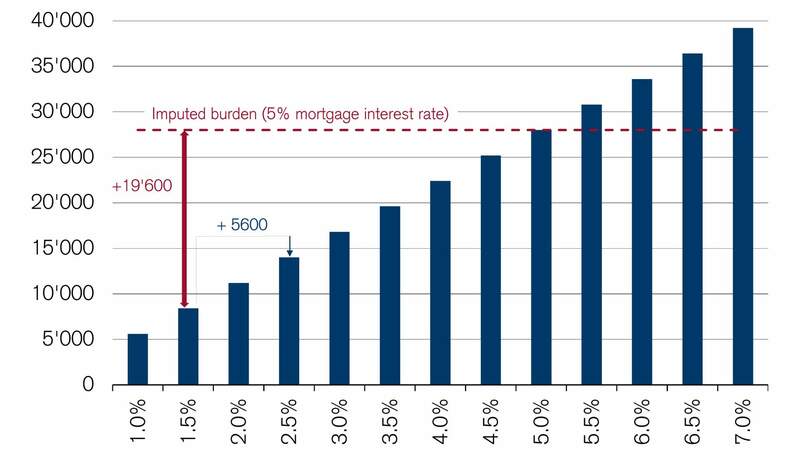 If mortgage interest rates increased by one percentage point from their current level, the annual mortgage interest burden on all owners would balloon by CHF 7.3 billion (with a considerable delay, however, because of the higher percentage of fixed-rate mortgages). That money would then no longer be available for other purchases, for instance. We will be happy to assist you. Please call us at 0844 100 111, or schedule a personal consultation.